It is a symbolic watch. The 4000 m watch. 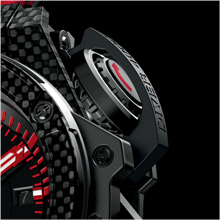 A watch developed for pushing the limits of what is rational and possible. It has taken 18 months of research, development and testing to present the Oceanographic 4000, a watch which can be worn on dives to depths of 4,000 metres, under extreme pressure - an exceptional technical achievement. For the 4th edition of Only Watch, Hublot is proud to support the event with the presentation of a unique, brand new Oceanographic 4000. 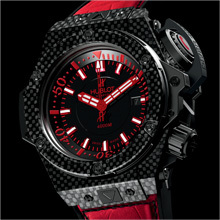 Unique, because it is the very first piece in a new family of ultra technical watches - not yet delivered - developed by Hublot to be able to dive to extreme depths of up to 4000 m. Brand new because, to distinguish itself from those that will follow, it possesses an aesthetic balance perfectly in keeping with the principality, featuring red and white indexes to reflect the colours of the Monaco flag. 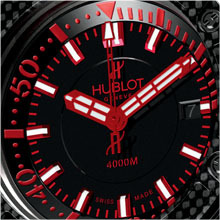 In addition, the Oceanographic 4000 takes its name directly from the "Musée Océanographique de Monaco" (Monaco Oceanographic Museum) with which Hublot enjoys a partnership. A particularly fitting creation for the principality, the venue and birthplace of the Only Watch initiative.